Retail giant Amazon is a popular shopping destination for many people around the globe but if you're yet to shop with this well-known online retailer, we have ten reasons that might persuade you to just give them a try. The number of products available from Amazon UK outstrips many other stores, both online and on the highstreet. From cables and batteries to cameras and tripods, Amazon UK has everything a photographer needs for their kit bag. Don’t know what you’re looking for specifically? Amazon are here to help with their bestsellers lists, reviews, star ratings and the option to order products by price. Descriptions are also detailed and often accompanied by several images so you can get a good look at the product before you make a purchase. All orders of £20 or more of eligible items, dispatched by Amazon, across any product category qualify for free delivery. With free delivery, your items will arrive within 3-5 business days after all of your items are available to be dispatched, including pre-order items. If your order contains £10 or more of eligible books, your order will also qualify for free delivery. Those with 'Prime Membership' can receive free one-day delivery as part of their package (see point four). When ordering expensive items, such as cameras and lenses, knowing where they are and when they will arrive brings peace of mind and some delivery options on Amazon UK give you the option to track your delivery, including the location of the van as it's delivering packages. 'Prime Membership' gives you access to unlimited 1-day delivery, TV shows, movies, music, over a million ebooks, 30-minute early access to Lightning Deals and unlimited photo storage. Amazon holds regular shopping events for Prime members and a sign-up now for a free 30-day trial is currently available. After the free trial, 'Prime Membership' is priced at £7.99 a month or you can purchase the annual plan for £79 (equivalent to £6.58 per month).You can cancel your membership at any time. You can also take part in Prime Day - arriving this year (2018) on 16 July at midday! You can return most new, unopened items sold and fulfilled by Amazon.co.uk within 30 days of delivery for a full refund. Amazon accepts a variety of payment options, including credit and debit cards, and once you've signed up for an additional payment verification programme (e.g. "Verified by Visa", or "MasterCard SecureCode") with your bank or financial institution, Amazon can connect with your bank or financial institution for this additional protection. Those with an Apple device can also use Touch ID to log-in to their account when making payments making the shopping process even more secure. Amazon regularly checks RRPs against prices recently found on Amazon.co.uk and other retailers' websites, plus the prices they offer are, generally, very competitive. Amazon aims to offer consistently low prices on every item in their store and they even offer NUS Student Discounts. Unlike other stores, Amazon UK has offers running every day on a wide variety of items. Deals of the Day ends at 11:59 pm (subject to availability) and Lightning Deals are available until the time the deal expires (subject to availability). You can even watch upcoming deals so you don't miss out on a bargain. If you've not heard about this section of Amazon UK, you should go take a look at as some amazing discounts on electronics can be found. Warehouse Deals is where great deals on returned, warehouse-damaged, used, or refurbished products that are in good condition but do not meet Amazon.co.uk rigorous standards as "new" can be found. Plus, the products come with all of the benefits of Amazon UK fulfilment and customer service. Amazon UK can store products in their warehouses, pick, pack and ship them so if an item is 'Fulfilled By Amazon' you know it will be arriving from a UK warehouse rather than another country which can be time-consuming. Amazon-fulfilled listings are displayed with the “Fulfilment by Amazon” logo, so you know that packing, delivery, customer service and returns are all handled by Amazon. OK Amazon can be a brilliant supplier and typically looks after customers well where they are a direct supplier. They have a superb range and where 100+ reviews are present its often a good indicator of truth. However, - If you don't pay by for amazon prime their free deliveries might appear to be deliberately delayed. Its sometimes quicker, if you are not a prime member to use ebay etc or walk into a shop and pick up the item directly. - As a multi national you know they play the tax system to their legal advantage and make it hard for local knowledgeable suppliers to compete. - they are not always the cheapest, again ebay or other web shops might beat them on price. As might grey importers - though their avoided tax is now potentially to your direct benefit (note import duties may apply/be refunded) - Camera Price comparison websites help here. 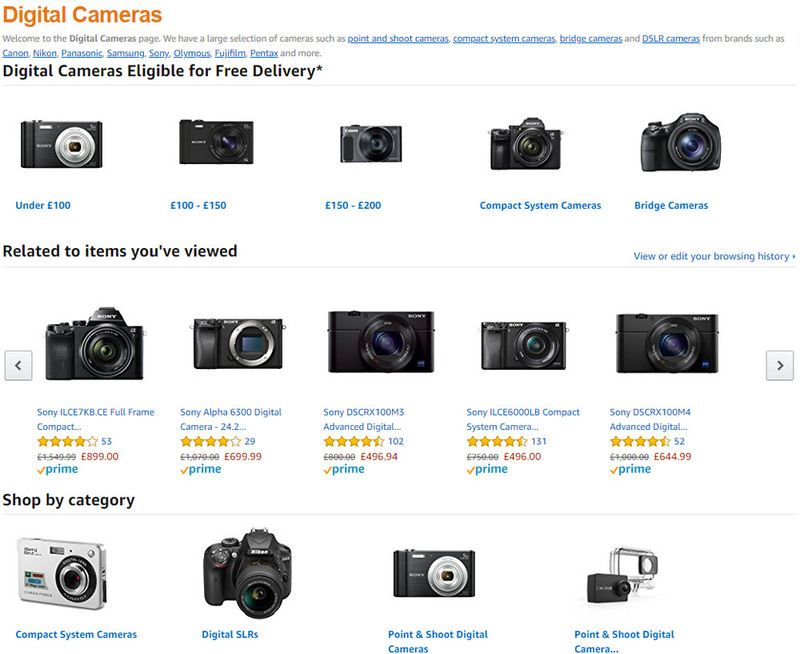 - a Local camera/other shop lets you see what you are buying and can advise you directly. So there are pro's (Can be cheap and quick) and cons (international not paying UK tax, and not always the cheapest). OK Amazon can be a brilliant supplier and typically looks after customers well where they are a direct supplier. They have a superb range and where 100+ reviews are present its often a good indicator of truth. - If you don't pay by for amazon prime their free deliveries might appear to be deliberately delayed. Its sometimes quicker, if you are not a prime member to use ebay etc or walk into a shop and pick up the item directly. - As a multi national you know they play the tax system to their legal advantage and make it hard for local knowledgeable suppliers to compete. - they are not always the cheapest, again ebay or other web shops might beat them on price. As might grey importers - though their avoided tax is now potentially to your direct benefit (note import duties may apply/be refunded) - Camera Price comparison websites help here. - a Local camera/other shop lets you see what you are buying and can advise you directly. So there are pro's (Can be cheap and quick) and cons (international not paying UK tax, and not always the cheapest).